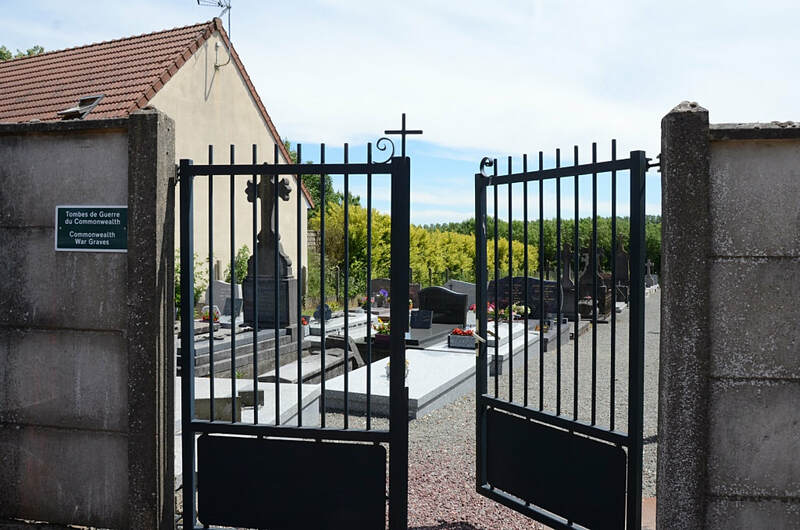 La Cauchie is a village in the department of the Pas de Calais situated just off the main road from Arras to Doullens, N25, along the D26 approximately 20 kilometres south west of Arras and 16 kilometres east of Doullens. 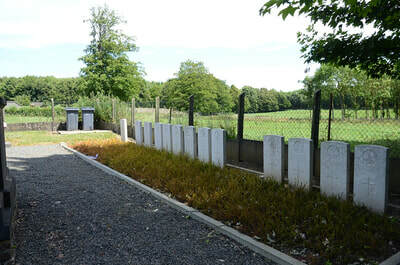 There are 13 Commonwealth servicemen buried here, all from World War One. 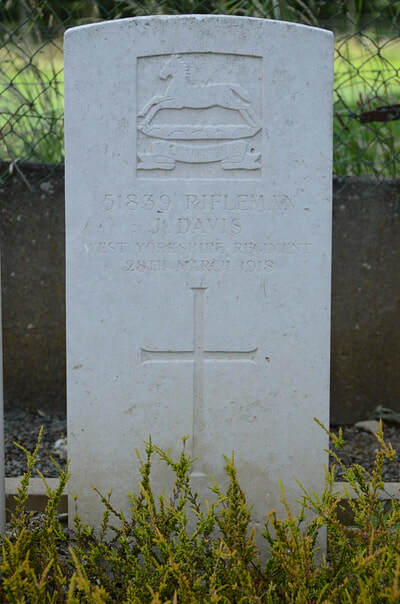 51839 Rifleman J. Davies, 2nd/7th Bn. West Yorkshire Regiment (Prince of Wales's Own), died 28th March 1918. Son of Mr. & Mrs. W. Davis of 54 Grafton St., Newtown, St. Helens, Lancs. 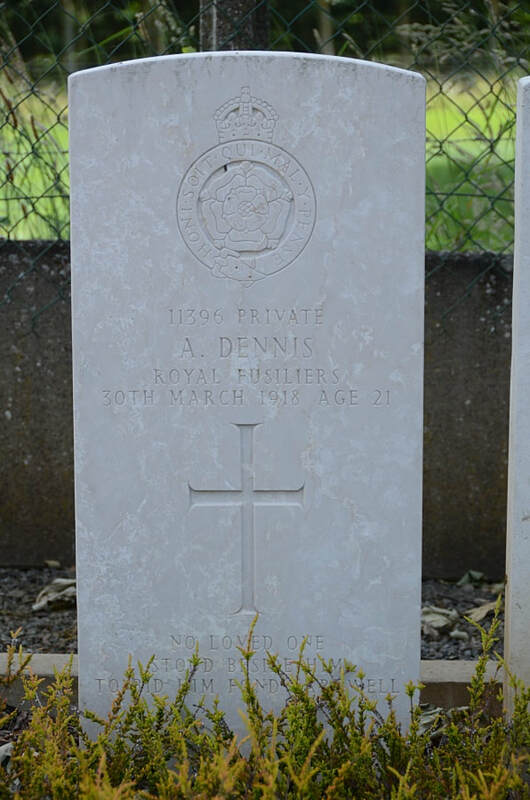 11396 Private A. Dennis, 26th Bn. 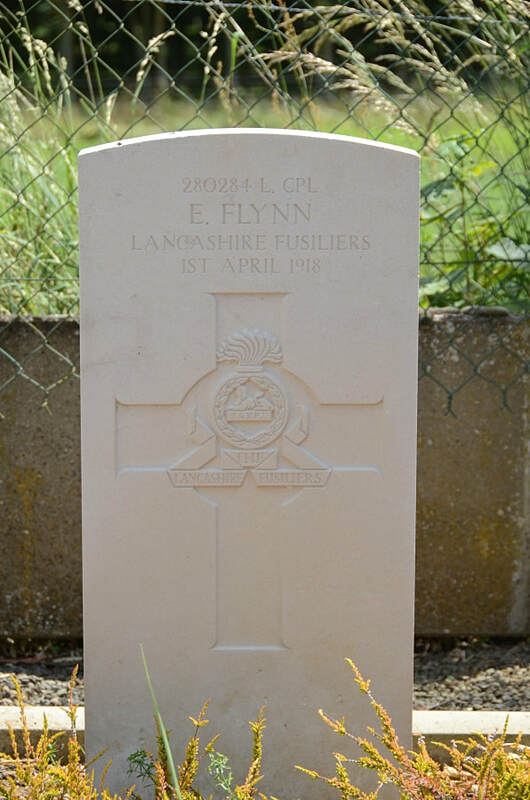 Royal Fusiliers, died 30th March 1918, aged 21. Son of William and E. Dennis of Beacontree Heath, Romford, Essex. 280284 Lance Corporal E. Flynn, 1st/7th Bn. Lancashire Fusiliers, died 1st April 1918. 401279 Private Percy Furman, 2nd/1st West Riding Field Ambulance, Royal Army Medical Corps, died 27th March 1918, aged 25. Son of Mrs. S. E. Kemplay (formerly Furman) of 2 Cross Heald St., Beeston Road, Leeds, and the late Harry Furman. 401222 Lance Corporal Ernest Kenyon, 2nd/1st West Riding Field Ambulance, Royal Army Medical Corps, died 27th March 1918, aged 25. Husband of Lilian Kenyon of 4 Berkeley Crescent, Harehills, Leeds. 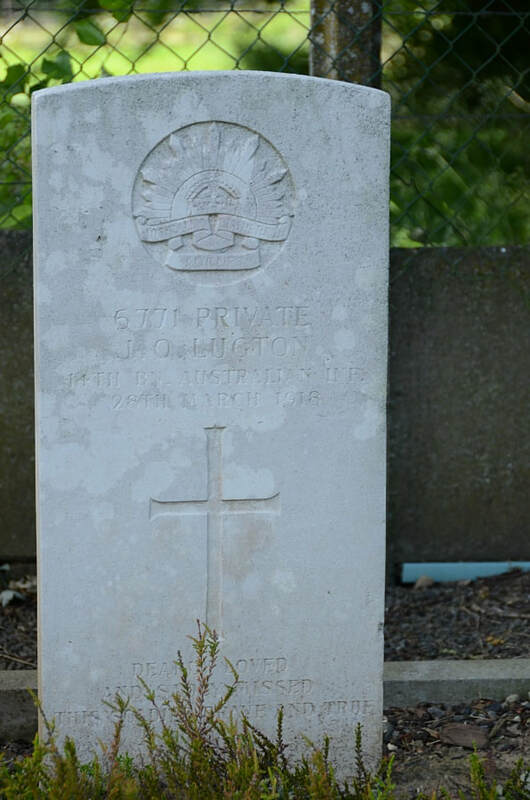 6771 Private James Oliver Lugton, 14th Bn. Australian Infantry, died 28th March 1918. 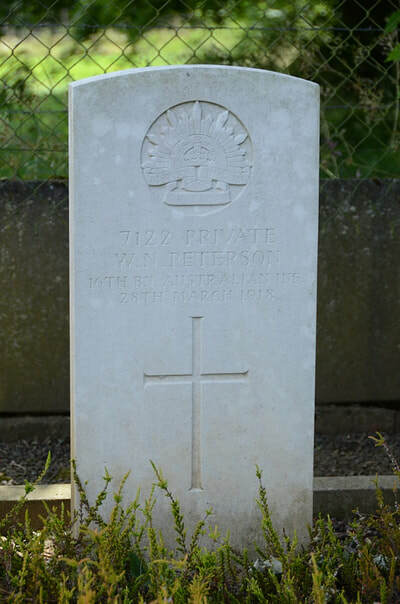 Son of Peter William and Mary Lugton of Esplanade, Wagga Wagga, New South Wales, Australia. Native of Rynton, Victoria, Australia. 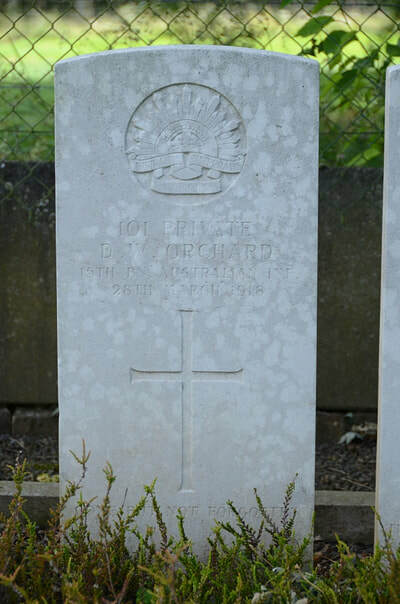 101 Private David William Orchard, 15th Bn. 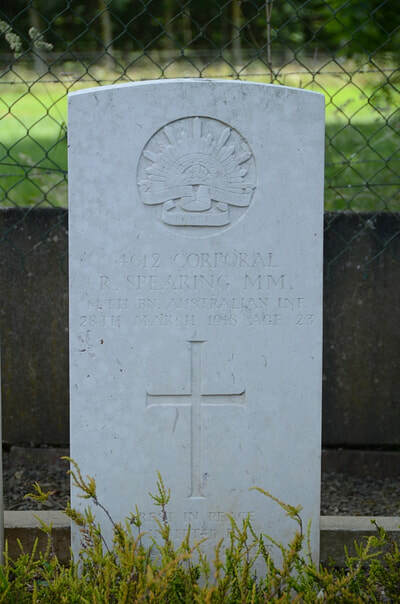 Australian Infantry, died 28th March 1918, aged 23. Son of Alfred Arthur and Sarah Jane Orchard of Gnomery Station, Goodooga, New South Wales, Australia. Native of Warren Downs Station, Carinda. 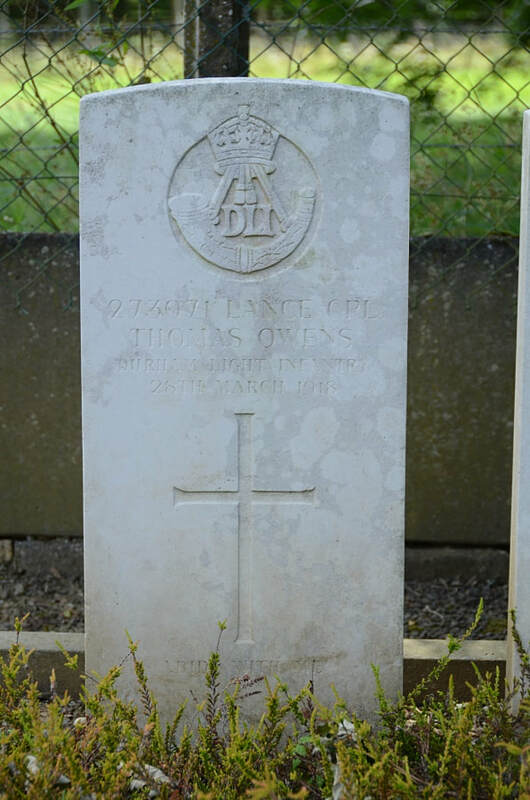 273071 Lance Corporal Thomas Owens, 9th Bn. 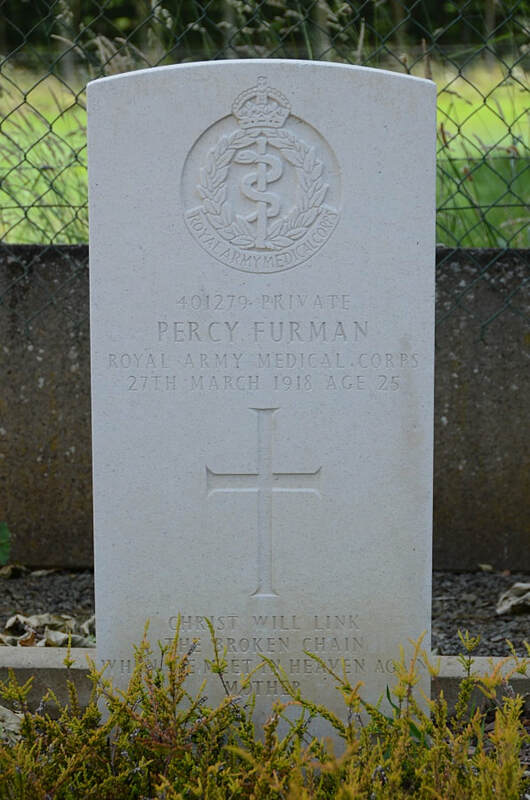 Durham Light Infantry, died 28th March 1918, aged 22. Son of John William and Mary Ann Owens of 49 Mansfield Street, Gateshead. 7122 Private Walter Nathanael Peterson, 16th Bn. Australian Infantry, died 28th March 1918. 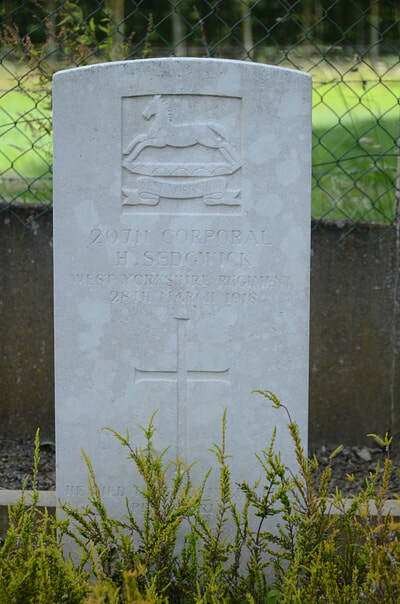 20711 Corporal H. Sedgwick, 2nd/5th Bn. 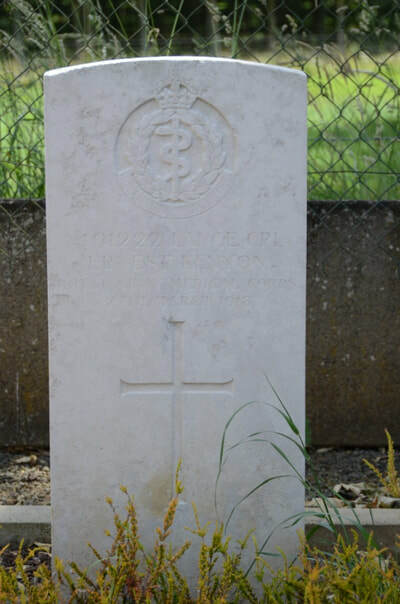 West Yorkshire Regiment (Prince of Wales's Own), died 29th March 1918, aged 22. Son of Duke and Emma Gertrude Sedgwick of 1 Salisbury Terrace, Akroydon, Halifax, Yorks. 219 Private Edward Ellis Smith, 13th Bn. Australian Infantry, died 28th March 1918. Son of William and Sophia Hudson, of Kempsey, New South Wales; husband of Julia Smith, of St. Julians, Malta. Also known as Edgar Ellis Hudson. 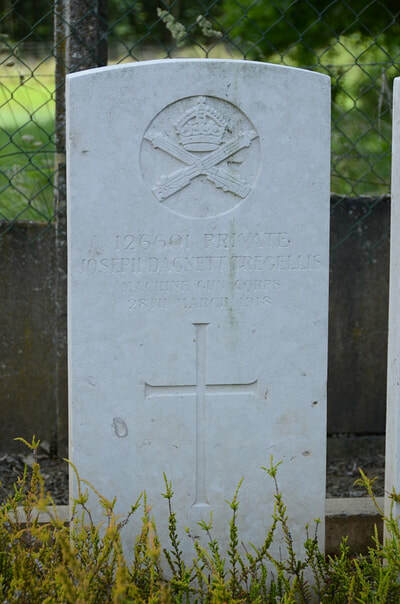 126601 Private Joseph Daynett Tregellis, 52 Bn. Machine Gun Corps (Inf.) 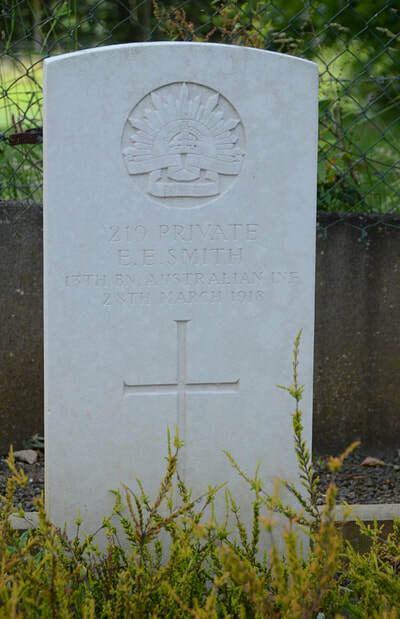 died 28th March 1918, aged 19. Son of Joseph and Ada Tregellis of 3 Mardale Street, Shepherds Bush, London. 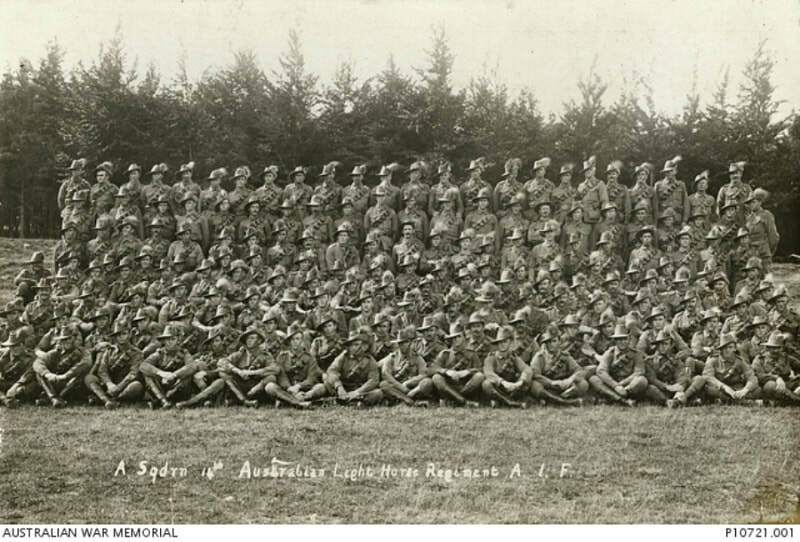 Group portrait of A Squadron, 14th Australian Light Horse Regiment. The regiment was disbanded in England in September 1916, to be reformed (with different personnel) in Palestine in 1918. 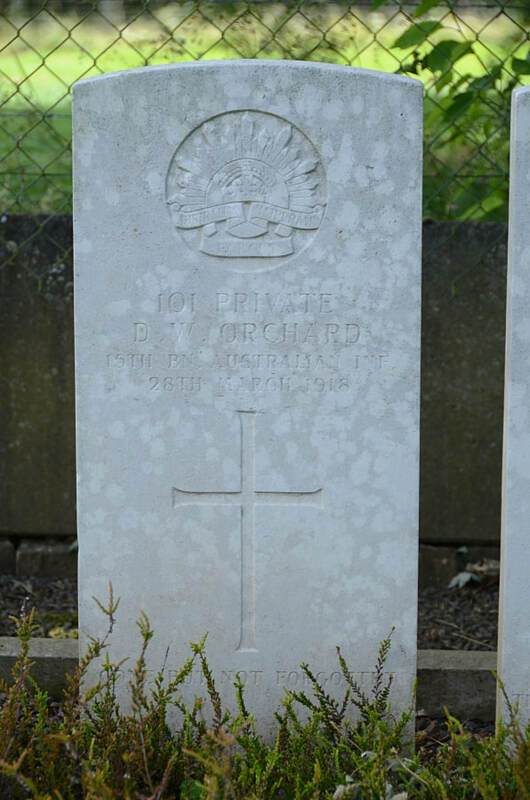 Identified, front row , from left: 46 Private (Pte) George Emery; 130 Pte William Richard Sheehan or 137 Pte John Sheehan (later 137A 49th Battalion - KIA 25 April 1918); 84 Pte William Margerrison, MM (later 84A 9th Battalion - KIA 1 October 1917); 150 Pte Joseph George Winkel; 75 Pte Phillip Peterson Jolly (later 31st Battalion - KIA 26 September 1917); 61 Pte Edwin Clinton Hurle; 148 Pte Arthur Wintle Willis or 154 Pte Gilbert James Willis; 90 Pte Michael Egan; 55 Pte Thomas Boyd Hall; 33 Pte Ernest Milton Collins (later 51st Battalion - DOW 17 September 1918) or 36 Pte Roy Harold Collins; 121 Pte Andrew Jack Labatt; 19 Pte Stanley Percival Bangs; 125 Pte Albert William Silvester; 17 Pte Frederick Charles Aylott, MM; 126 Pte Bertie Simpson (later 25th Battalion - DOW 12 June 1918); 54 Pte Leonard James Gillespie. Second row: 123 Pte Alexander Rolfe; 142 Pte Alexander Low Stevens, MM; 146 Pte George William Harry White; 41 Pte Henry Donaldson; 52 Pte Robert Beach Ferguson; 143 Pte George Nicolai Ulbrick; 7 Corporal (Cpl) Thomas Harvey Campbell (later 7A Lance Sergeant 41st Battalion - DOW 9 July 1917); 23 Pte Charles Blake; 63 Pte William James Hopkins; 149 Pte Oswald Urbin Tardent; 12 Pte Robert Boyd (later Sgt 15th Battalion - DOW 9 April 1917); 9 Cpl Bertie Clarence Nixon; 58 Pte Robert Chalmers Gray; 115 Pte William Charles Albert Robinson; 15 Cpl Douglas Robert Lang; 10 Cpl William Henry Norman, MM; 146A Pte Lionel Henry Skillington. 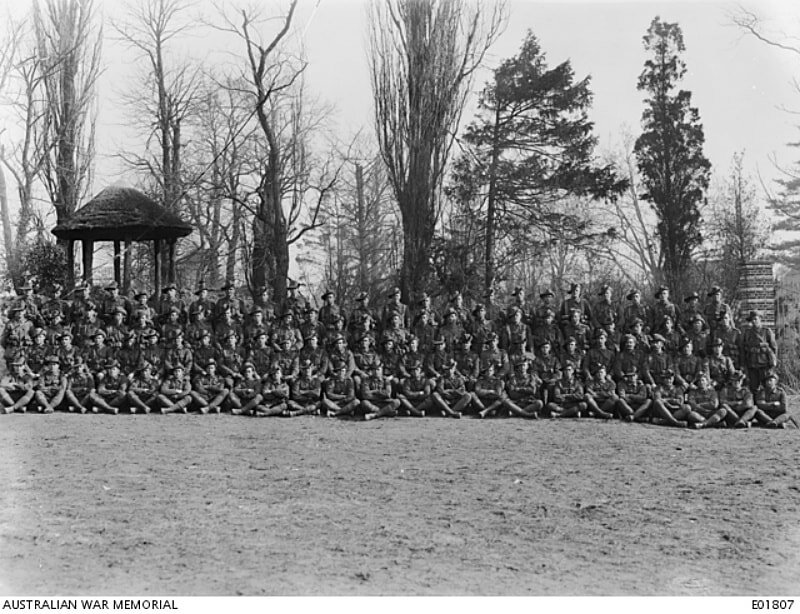 Third row: 72 Pte William Frederick Tyler Jones; 112 Pte Arthur Quigley; 8 Cpl Duncan Stewart Carseldine; 3 Cpl Griffith Thompson; 5 Sergeant (Sgt) Harold Aubrey Ingram; 4 Sgt Henry Estwick Ford ; 1 Sergeant Major James Edward Ryan, CSM; Lieutenant (Lt) James Wilson; Lt Samuel Alexander Richards; Captain Frank Butterworth; Second Lieutenant (2nd Lt) Arthur Archibald Cameron (later 9th Battalion - KIA 26 February 1917); 2nd Lt Leonard Henry Pike; 2nd Lt Robert Henry Neaverson (later Lt XXII Corps Light Horse - KIA 26 April 1918); 14 Sgt Christopher Rutherford (Vet Surgeon); 2 Sgt Rex Stapylton Bree, Coy QMS; 6 Sgt Patrick Olliver QM; 13 Sgt Walter McGill; 122 Pte William Reginald Reece; 251 Pte Cecil Neal Anderson. 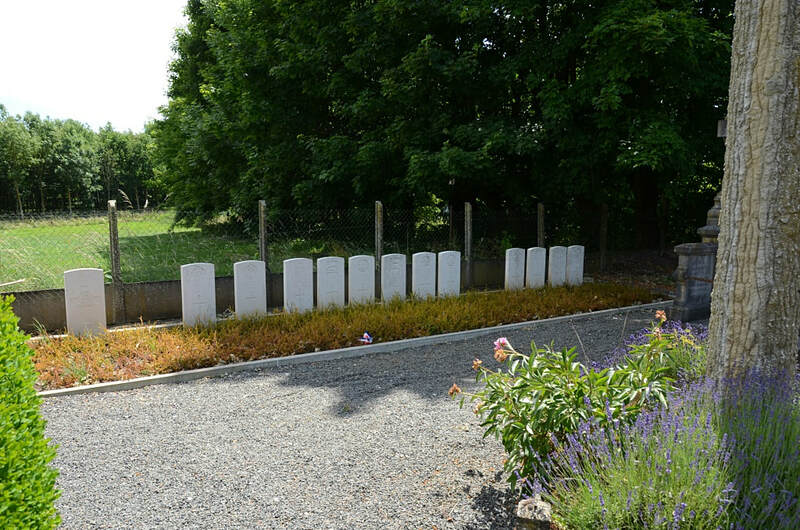 Fourth row: 129 Pte James Edward Strong; 21 Pte Charles William Butterfield; 65 Pte George Hine (later 9th Battalion - KIA 20 June 1918); 69 Pte Clarence Leslie Donald Hamilton; 144 Pte James Joseph Wilson or 156 Pte James Robert Wilson; 53 Pte Charles James Flutter; 95 Pte Richard George Nixon; 94 Pte John Francis McNulty (later 31st Battalion - DOW 25 November 1917)(see P08516.003); 110 Pte Arthur Knight Pengelly; 25 Pte Roy Brown or 29 Pte William James Brown (later 52nd Battalion - DOW 13 April 1917); 16 Pte Sydney Sutherland Allan; 44 Pte Charles Duncan (later 52nd Battalion - KIA 23 September 1917)(see P05646.001); 137 Pte John Sheehan (later 137A 49th Battalion - KIA 25 April 1918) or 130 Pte William Richard Sheehan; 64 Pte William John Hutton (later Sgt 52nd Battalion - DOW 16 July 1917); 77A Pte Arthur Edward Kerr; 128 George Edward Stace; 50 Pte William Albert Franklin; 34 Pte Charles Cox; 262 Pte William Kerr Symons; 253 Pte Ferdinand Augustus Chapman, MM and Bar. Fifth row: 47 Pte Albert Edwards; 121A (105) Pte Arthur William Prebble; 119 Pte Harold Ross; 114 Pte John Michael Rynne (later 114A Trooper 11th LHR - KIA 25 September 1918); 81 Pte Henry Manning; 37 Pte Charles Edward Clarke; 88 Pte John Vincent Meagher (later LCpl 41st Battalion - KIA 25 June 1917); 101 Pte David William Orchard (later 15th Battalion - DOW 28 March 1918); 117 Pte Alfred Russell; 103 Pte Oliver James Wesley Parrish; 85 Pte Jack Munroe (later 85A 9th Battalion - KIA 25 February 1917); 18 Pte Cecil Vincent Armstrong; 154 Pte Gilbert James Willis or 148 Pte Arthur Wintle Willis; 83 Pte William Henry Mould; 106 Pte George Charles Pinkerton (later LCpl 15th Battalion - DOW 6 July 1918); 62 Pte Frederick Albert Foster Hardy (later 52nd Battalion - KIA 9 June 1917); 22 Pte Phillip Bashford; 49 Pte Frederick Walter Faulkner; 120 Pte William Patrick Ryan, MM or 260 Pte Edward Thomas Ryan; 43 Pte Charles Henry Day (later 4th Battalion AMGC - DOI 15 November 1918). 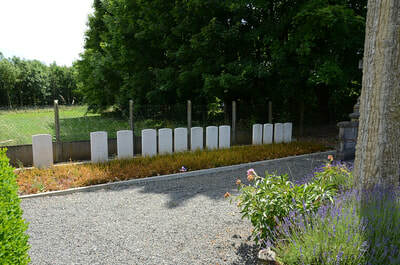 Sixth row: 35 Pte George Mark Cooling; 252 Pte Frederick John Ashton; 31 Pte Edwin Cragg (later 52nd Battalion - KIA 7 June 1917); 78 Pte Thomas William Lovell; 134 Pte Hamilton Shaw; 56 Pte John James Glass (later 52nd Battalion - KIA 9 June 1917); 89 Pte Henry Samuel Hugh McCaroll; 91 Pte William James McDougall; 45 Pte William Edgell; 141 Pte Thomas Thwaite; 82 Pte Thomas Morris; 111 Pte James Quinlan; 98 Pte Arthur Daniel Nicholls (later 15th Battalion - KIA 28 January 1917); 73 Pte Harold Winter Jackson; 138 Pte Arthur James John Turpin; 36 Pte Roy Harold Collins or 33 Pte Earnest Milton Collins (later 51st Battalion - DOW 17 September 1918); 139 Pte William Thomas Bruce Taylor; 131 Pte Robert Charles Abel Steley; 116 Pte James Russell; 104 Pte Charles Albert Pearce; 159 Pte Albert George Pearce; 93 Pte James Gordon McGregor; 145 Pte Edward Thomas Walsh. Seventh row: 149A Pte Francis Frederick Williams; 254 Pte Benjamin Joseph Curran; 135 Pte Frederick Ernest Stenner; 133 Pte Frank Slade (later LCpl 49th Battalion - KIA 7 June 1917); 48 Pte Wilfred Henry Leon Elliot; 66 Pte William Nathaniel Nelson Hide; 260 Pte Edward Thomas Ryan or 120 Pte William Patrick Ryan, MM; 96 Pte Reginald McQuattie Haygaith Nicoll; 99 Pte Jeremiah O'Sullivan (later 99A 9th Battalion - KIA 7 May 1917); 57 Pte Henry Thomas Garrahy; 28 Pte David Kirk Beckman; 127 Pte William Stokes; 256 Pte David Livingstone Graham (later 256A 31st Battalion - DOI 19 December 1916); 155 Pte John Henry Wright; 60 Pte Lemnel Thomas Howard; 88 Pte Garnett Cecil McClennan; 102 Pte Robert William Olsen; 118 Pte William John Thomas Rowe (later 15th Battalion - KIA 13 August 1918); 136 Pte Robert Charles Schloss; 27 Pte Albert Victor Hewitt; 152 Pte Edgar Parker; 153 Pte Charles John Newton Winks. Eighth row: 265 Pte Tom Wilde (later 31st Battalion - DOW 2 October 1917); 258 Pte John Marsh; 255 Pte Bailey Doyle; 156 Pte James Robert Wilson or 144 Pte James Joseph Wilson; 67 Pte Edward Albert Herring; 107 Pte Harold Pilkington; 29 Pte William James Brown (later 52nd Battalion - DOW 13 April 1917) or 25 Pte Roy Brown; 132 Pte Leslie Sims (later 132A LCpl 49th Battalion - KIA 28 March 1918); 74 Pte Alexander William Jounquay; 124 Pte Thomas Patrick Rahal; 108 Pte George Potter, MM; 68 Pte John Hogan; 79 Pte Waldemar Nessen Lauman; 42 Pte David Davidson; 32 Pte Clarence William Campbell; 86 Pte John Vivian Moody; 261 Pte Joseph Edwin Randall; 39 Pte Angus Stuart Duff; 87 Pte Ernest Belmore Moody; 109 Stephen Payton; 76 Pte Victor Linklater (later 93 LCpl 41st Battalion - DOW 29 March 1918); 264 Pte Donald David Thompson; 263 Pte John Smith, MM and Bar; 20 Pte Frederick Bowman. 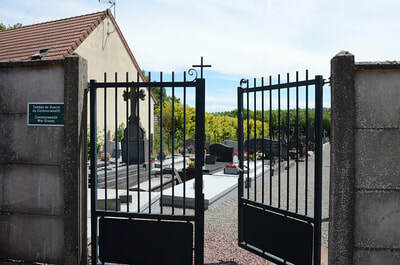 Neuve Eglise, Belgium. 11 March 1918. Group portrait of the NCOs of the 14th Battalion. Left to right, back row: 5045 Lance Corporal (LCpl) G. Brooks; 5259 LCpl L. A. Anderson; 6099 LCpl J. Skjellerup (killed in action 3 May 1918); 5999 LCpl A. R. Rowe; 4920 LCpl A. R. Rowe; 5757 LCpl W. Alwood; unidentified; 7285 Corporal (Cpl) J. J. Moriarty (killed in action 8 August 1918); 1798 LCpl J. O'Brien; 2607 Sergeant (Sgt) T. N. Hughes MM; 6614 Sgt L. A. Webb; 3814 Cpl E. Howell; 4612 LCpl R. Spearing; 4344 Cpl A. G. Heron; 2429 Lance Sergeant (LSgt) C. C. Sergeant; 5126 Cpl M. R. Johnston; 4563 Cpl E. W. J. McGrath; 3527 Sgt A. P. Whitelaw; 6022 Sgt T. H. French DCM MM; 5651 Sgt G. Dorrington; 2635 Cpl W. H. Rutherford MM and Bar; 602 LCpl Kent (killed in action 31 May 1918); 5979 LCpl A. S. Brady; 5450 LCpl A. C. Squires. Third row: 6361 Cpl J. Tregelga; 61 Cpl Harding MM; 5369 Cpl T. Feehan; 5330 Cpl J. W. Barker; 4159 Sgt Cartledge; 1386 Sgt G. Murphy; 7478 Sgt J. Dillon; 144 Sgt J. E. Watson; 977 Company Sergeant Major (CSM) G. R. Hare; 7526 Sgt F. J. Leonard; 3424 Sgt P. F. Muir MM; 3359 Sgt P. J. Harris; 4158 Sgt J. Cartledge; 4172 Sgt D. Drummond MM; 3391 Sgt J. McPherson DCM; 4200 Sgt F. A. Good MM; 2650 Sgt H. T. Stach; 1583 Sgt H. R. Anderson (killed in action 16 June 1918); 7447 Sgt G. N. Bryceson; 1379 Sgt G. Murray; 2435 Sgt W. P. F. Ryan DCM; 1578 Sgt G. J. Clark DCM MM and Bar; 1927 Cpl H. P. Curwen; 5029 Cpl A. T. Abraham; 5994 Cpl H. C. Clements MM; 5728 Cpl H. C. Roberts. Second row: 2690 LSgt H. W. Hollis; 59 Staff Sergeant (SSgt) A. B. McLellan MM; 2769 CSM C. J. Campbell MM; 766 LSgt N. Christenson; 4195 LSgt J. F. Gundry; 3398 LSgt R. L. McHenry; 38 Sgt G. Bullen DCM; 4260 Sgt K. McHenry; 3297 Sgt C. H. Callant; 5330 Sgt J. W. Baker MM; 3811 CSM A. A. Hore MM; 914 Regimental Quartermaster Sergeant (RQMS) C. L. Russell MSM; 5995 Regimental Sergeant Major (RSM) L. Collins DCM; 1810 CSM A. Rich; 2464 CSM W. Coleman DCM MM; 481 Company Quartermaster Sergeant (CQMS) H. B. Mitchell; 2365 Sgt W. J. Douglas; 4185 Sgt W. H. Fergus DCM; 2579 Sgt F. W. Dalitz MM; 124 CQMS A. Sergeant; 676 Sgt H. A. Anderson MM (killed in action 18 September 1918); 4677 Sgt N. Crougey; 3490 Sgt G. Shields Belgian Croix de Guerre; 1990 Sgt J. J. O'Brien MM; 1901 Sgt A. E. Allen; 4160 Sgt A. Copperwaite. Front row: 5259 Sgt L. A. Anderson; 1901 LSgt A. A. Anderson; 3768 Sgt P. D. Gabell; 2473 Sgt L. Shelton; 643 Cpl A. Duncan; 7071 LCpl W. A. Reid (killed in action 18 June 1918); 5690 LCpl N. D. Lewin; 3813 Cpl J. Howell; 3761 Cpl S. A. Foster MM; 5720 LCpl T. Richardson; 2954 LCpl A. Smith; 2357 LCpl A. T. Curry; 5457 LCpl S. A. Parker; 4437 Cpl J. S. Bamford; 6406 Cpl A. C. Kilby MM; 7006 Cpl M. L. Evans; 6735 LCpl W. Goodsell MM; 141 LCpl L. R. Jones MM (killed in action 18 September 1918); 1708 Cpl W. L. Devereaux; 1872 LCpl J. H. Dunn; 5762 LCpl H. S. Cochrane; 3413 Cpl B. Milkins; 6011 Cpl R. Feckner MM.